Several years after Ryutaro Asada's departure from Meishin University Hospital, the hospital has been in rapid decline due to Takeo Noguchi's (Ittoku Kishibe) scandal and a rise of lawsuits due to the poor quality of new surgeons. The new dean of the university, Shoko Kito (Mari Natsuki), calls a press conference and states the hospital will be rebuilt with an emphasis on education & clinical research. During this time in America, Akira Katou (Izumi Inamori) successfully transplants a young woman's heart which astounds his foreign professors and on a battlefield Ryutaro Asada treats a bomb injured woman. A patient, who fell off of a motorcycle and into a river, is brought to the ER of Meishin University Hospital. Doctors Noboru Ijyuin (Teppei Koike) and Takehiko Kihara (Tetsuhiro Ikeda) perform surgery, but are about to close the chest of the patient due to their inability to help the patient. This is when Ryutaro Asada walks into the ER. He orders the doctors to continue with the surgery and with the help of Ryutaro Asada are able to save the patient. In the viewing room Shoko Kito & Akira Katou watch the entire procedure. Akira Katou visits the hospital where Keisuke Fujiyoshi (Kuranosuke Sasaki) works and persuades him to complete the regenerative medical research back at Meishin University Hospital. A rumor starts to spread that the Meishin University Hospital's Team Medical Dragon will be revived, even though Dr. Monji Arase (Sadao Abe) refuses to step into the operating room due to an incident that occurred a year ago. By Keisuke Fujiyoshi's request, 17-year-old Yukina Sugatani (Nanami Sakuraba) is hospitalized at Meishin University Hospital. Yukina suffers from a rare heart disorder and all the other hospitals diagnosed her condition as untreatable. At this time, Noboru Ijyuin works as the training doctor for newly arrived Dr. Fuyumi Makara (Mitsuki Tanimura). Noburo takes Fuyumi to Yukina's room and explains possible treatment options. Yukina asks the doctors whether she can be cured and the doctors don't have an answer. 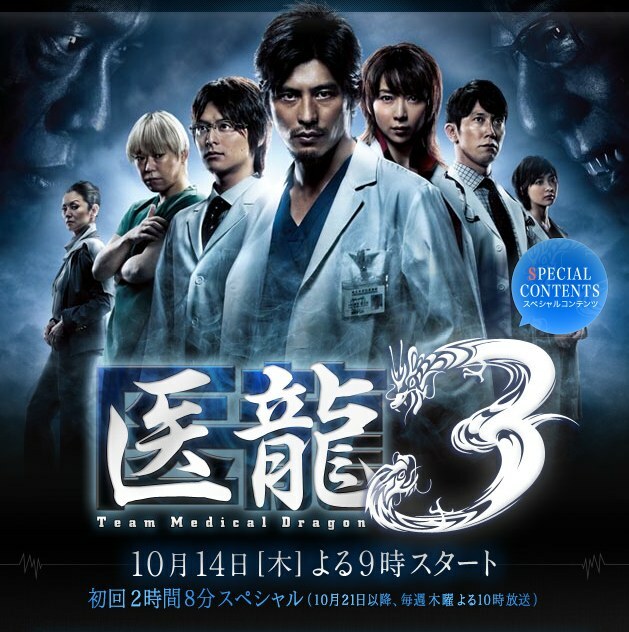 For season 3 of "Iryu: Team Medical Dragon" new characters include a doctor (played by Kenichi Endo), who is a rival to Ryutaro Asada & an intern (played Mitsuki Tanimura) who slowly warms up to Team Medical Dragon. Also, Izumi Inamori as Akira Katou returns for season 3 after not appearing in season 2.
marian Mar 21 2015 11:00 am Hoping for a fifth season. I enjoyed all seasons. This is just a superb show. A round of applause with standing ovation. This show is packed with operations and it's as if they're real doctors doing actual surgeries. I need to pause and then research more on the internet in order to catch up with what they are saying and doing haha. I never thought that the cariothoracic area of medicine is a very complicated but interesting subject. I've learned a lot of procedures like Batista, Bentall, Ross, Konno, cardiac catheterization, piggyback heart transplantation, MIDCAB, David, onbeat surgery to name a few. I want to know if Asada has a love interest in the manga, anyone? marian Mar 21 2015 9:03 am A round of applause with standing ovation. Are Japanese shows really this good? This is the first Japanese medical drama that I've watched and I'm impressed. What a superb and brilliant show. I wouldn't want to stop from season 1 to season 4; it's just so addicting. It has what I am looking for in a medical drama. Unlike in Korean medical dramas that focus on power struggle/drama/romance, this show is packed with operations with a little politics on the side. It's as if they're real doctors doing actual surgeries. Maybe they have devoted so much time and effort researching, practicing, and simulating surgeries; it's almost detailed with diagrams explaining a particular case and surgical procedure. Each operation gives you that tensed feeling. I never thought that the cariothoracic area of medicine is a very complicated and challenging but interesting subject. While watching, it will stimulate your thinking and imagination. I've learned a lot like procedures like Batista, Bentall, Ross, Konno, cardiac catheterization, piggyback heart transplantation, MIDCAB, David, onbeat surgery to name a few. Each character was given a chance to shine, and Noguchi, while annoying, he actually manages to give balance to the story, and his arowana is also funny. The main character is cool. Now, I want to be a doctor, but I don't have the calling and the brains haha. Even though Kenji has aged, he is still charming and hot. So sad that this show has come to an end. Will there be a chance for season 5? Anyway, I'm looking forward to other Japanese medical shows as brilliant or maybe better than this. Any suggestions? Yumbart Mar 16 2013 12:58 am I hope there is a season 4. Yes: season 3 wasn't anywhere near as strong as seasons 1 and 2 which were just awesome. The shaky hands subplot was lame - we knew Asada would come through, and they never developed the character of that new nurse. They shouldn't bring the creepy professor back either. His character was great in seasons 1 and 2, but he's a spent force. New stories please. All that said I as a fan of the series I still enjoyed it a lot. I liked the character of Kuroki and this was well handled. I hope the writers return to their original high form for a series 4 - without the creepy professor. Something new please. Daniel Jun 14 2012 10:15 pm I enjoyed a lot the third season. While its criticism doesn't seem to be so strong and explicit as previous seasons, it still gives food for thought. The surgery addicts will be let down in this new season, as it contains fewer new procedures when compared to others seasons (or so I felt it). Even though, those who have some knowledge in Medicine will see state-of-art procedures. Regarding to characters, they have become more charismatic or even more annoying. They have a bit more of depth. I liked specially Asada and his new rival. While I believe it made Iryu lose its sharp criticism from previous seasons, some characters have gaind a bit of human touch. Even though for those who really liked Iryu 1/2 and are afraid to dislike Iryu 3, I still think it is worth watching it. jess Jan 01 2012 2:48 am hate noguchi, he interferes with everything. taiga Sep 26 2011 2:46 am what is the insert song title ? the one which has nice soft melody? QueenAin Jun 19 2011 2:02 am where'e miki? i mean, where's she? transfered to somewhere or what? Donutgurl Apr 24 2011 1:15 pm Anyone know if there is going to be season 4? cocoax Jan 03 2011 2:24 am @diopatra & @Charles: her name is Hatsune Eriko, I've seen her in 'Satorare', or at least I think it's her... they look a like. Charles Dec 25 2010 8:13 am does anyone know the name of the actress who portrayed the nurse? why isn't she credited? Adrian Nov 23 2010 3:01 am anyone know the new song they put when there's an epic scene? such as the opening on ep 4? Hutsugo Nov 14 2010 9:10 am Kenji-san Ganbatte Ne!!!! Wish Miki-san is back!!!!!!!!!!! diopatra Nov 12 2010 2:45 pm who's that new nurse on episode 3? luke Nov 05 2010 8:38 pm where is Miki?? Team Dragon is not complete without her!! SoFF-OnE Nov 05 2010 4:28 am Asada sensei is back.This time with Katou sensei too!!Yeah..banzai2x! Daisy Oct 31 2010 6:48 pm Loved the 1st episode and the music was great as always but I didn't really like ep. 2 and 3 so much.... :-/ Hopefully it gets better. einzeckszen Oct 31 2010 12:53 am I hate noguchi... why he always in this drama??? rose Oct 29 2010 10:26 am i watched episode 1, and i feel like my heart stops for an hour..but i don't understand why they kept on bringing the bad professor with his creepy ugly smile. and the new surgeon looks like a drug addict. but i'm glad akira katou is back. yezzkk Aug 24 2010 7:32 am no kitamura kazuki?? !